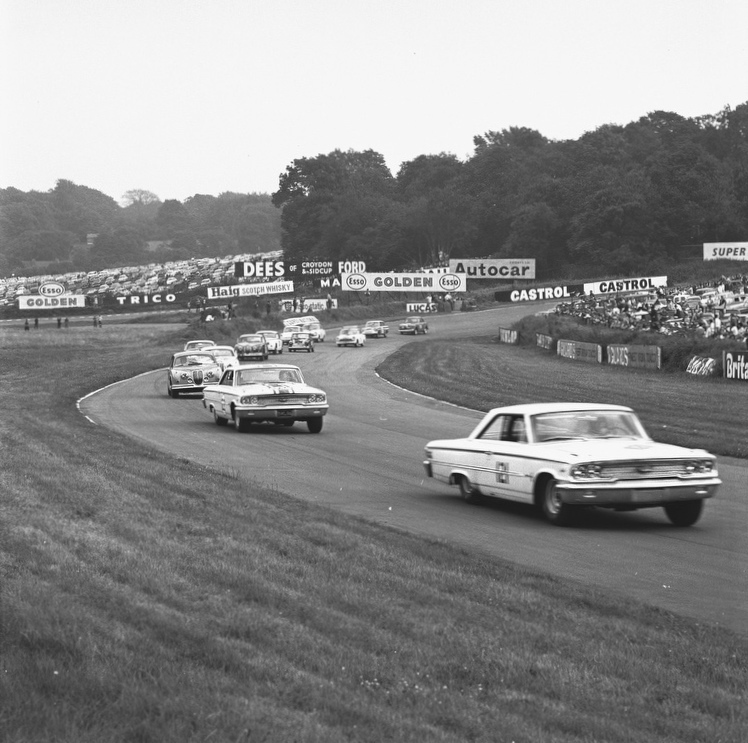 Monday, August 5, was a holiday in the UK in 1963, which meant that all eyes turned towards Brands Hatch for the Guards Trophy (as in Carreras Guards filter cigarettes). 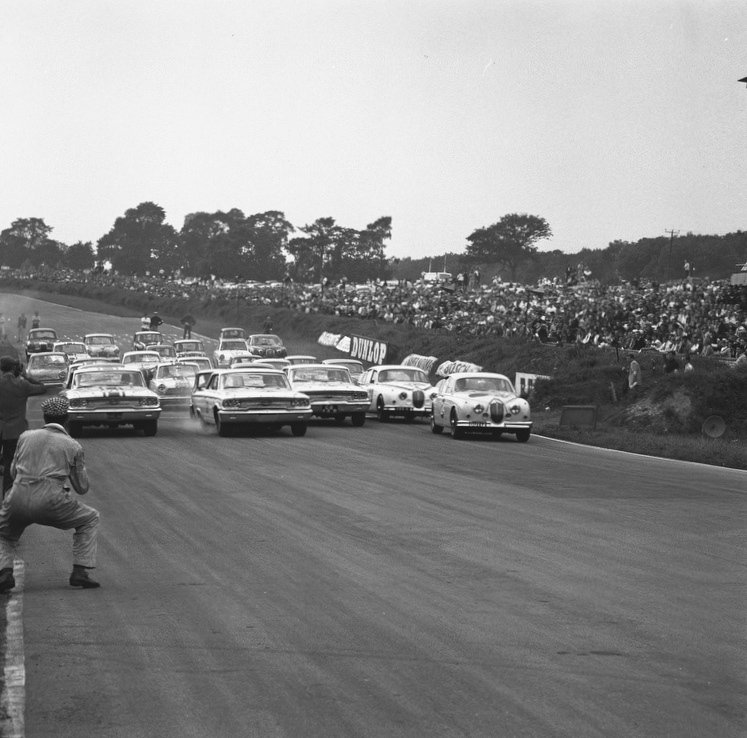 This was a classic British international race meeting run by the British Racing and Sports Car Club (BRSCC) in front of a classically-large crowd. 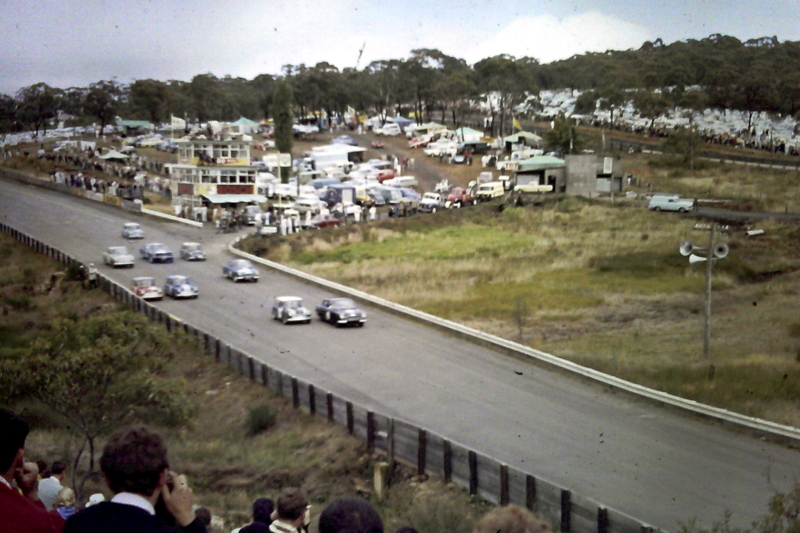 The feature race was for sports cars over 50 laps; support events were for saloon cars, smaller sports-racing cars and GT cars. 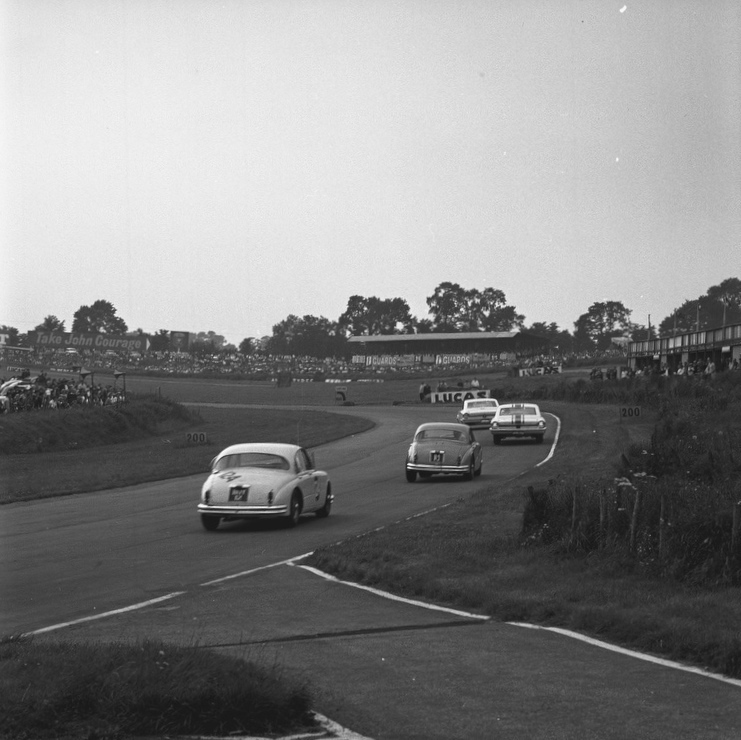 Consider that this meeting was staged exactly 24 hours after the German GP, and that the line-up of drivers at Brands included F1 stars like Jim Clark, Graham Hill, Lorenzo Bandini, Trevor Taylor, Innes Ireland and Tony Maggs, plus other names like Roy Salvadori Roger Penske, Jack Sears, Timmy Mayer, Paddy Hopkirk, Sir John Whitmore, Frank Gardner, Mike Salmon, David Piper, Lucien Bianchi, John Miles (the future Lotus F1 driver) and Ray Parsons, (Jim Clark’s part-time mechanic) and you have a picture of what motor racing in the 1960s was all about: it was about the drivers – about star names having one-off races in interesting cars, regardless of their chances of winning. 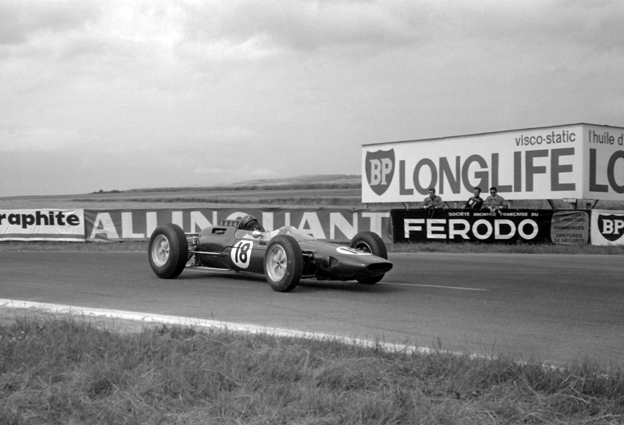 Trevor Taylor, for instance, jumped from an F1 Lotus 25 at the Nurburgring into a Lotus Elite at Brands. 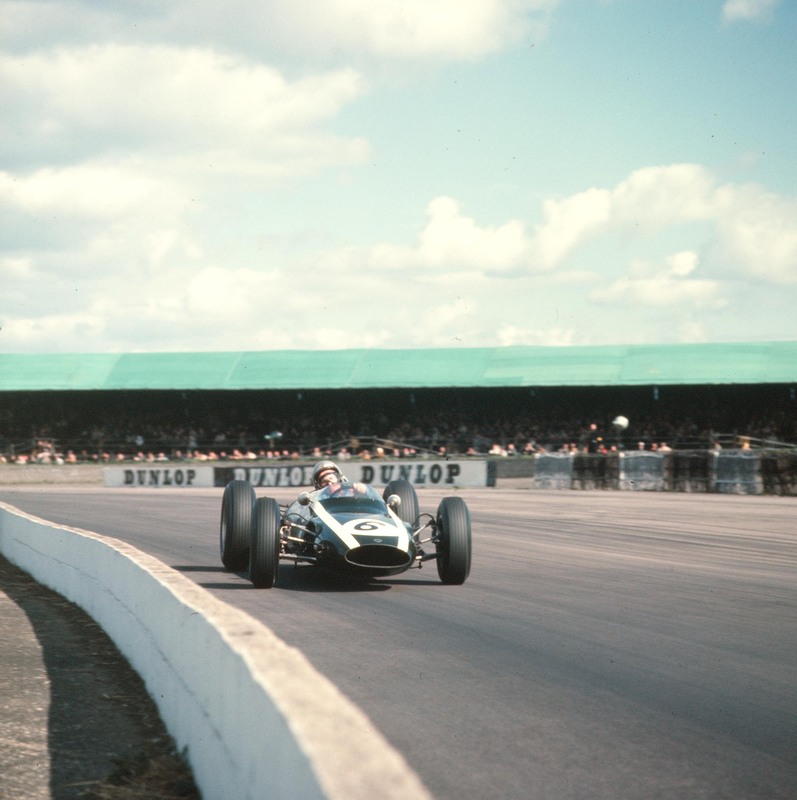 The World Champion, Graham Hill, swapped his works BRM for a Jaguar 3.8. 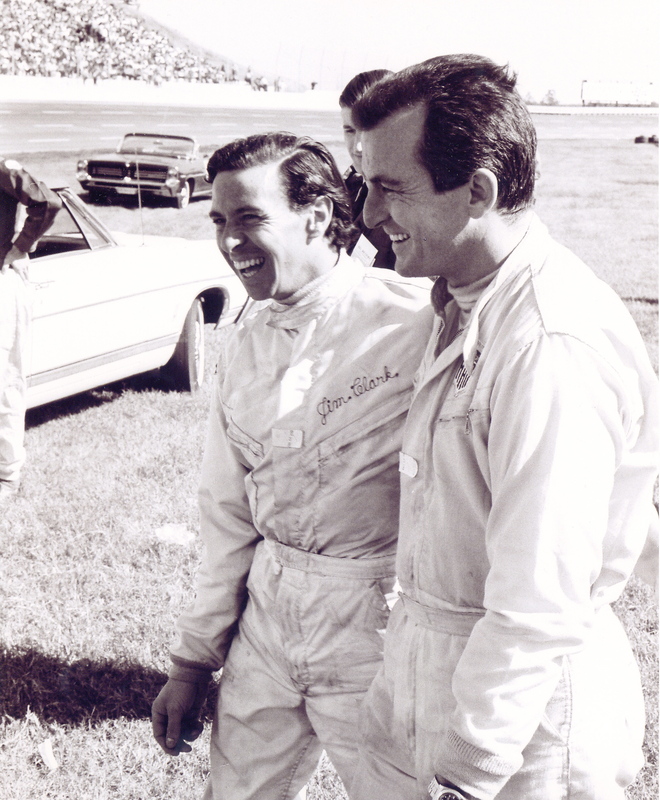 Le Mans winner, Lorenzo Bandini, went from his Centro Sud BRM to a big Ferrari 330LM. 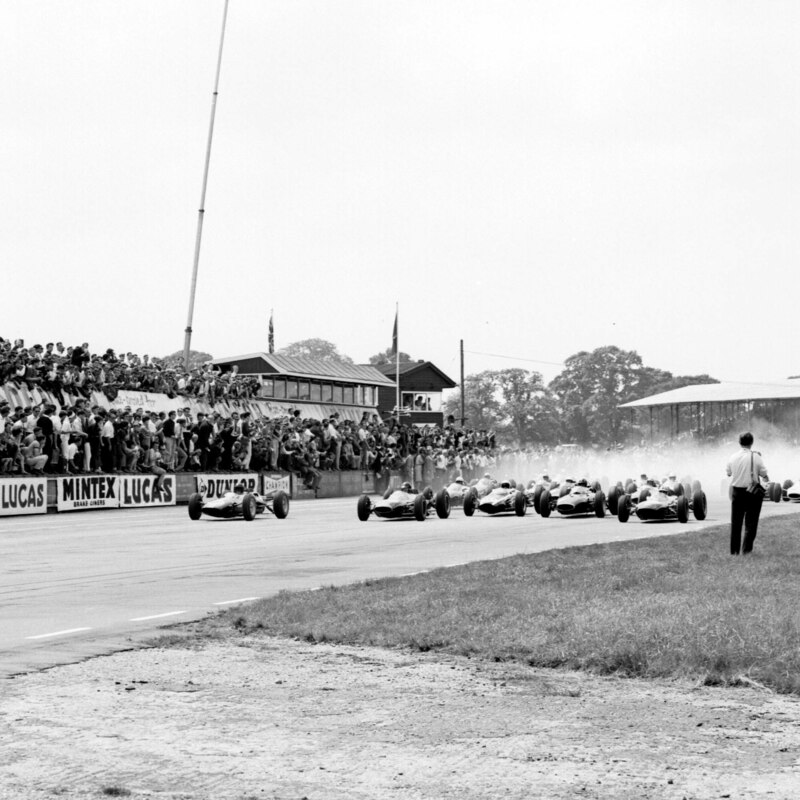 It’s hard to picture it, now – Jim, Graham, Trevor, Tony Maggs, Lorenzo and Innes all rushing back to England to race their widely-different cars at this Brands International. Jim wasn’t even in the big race! 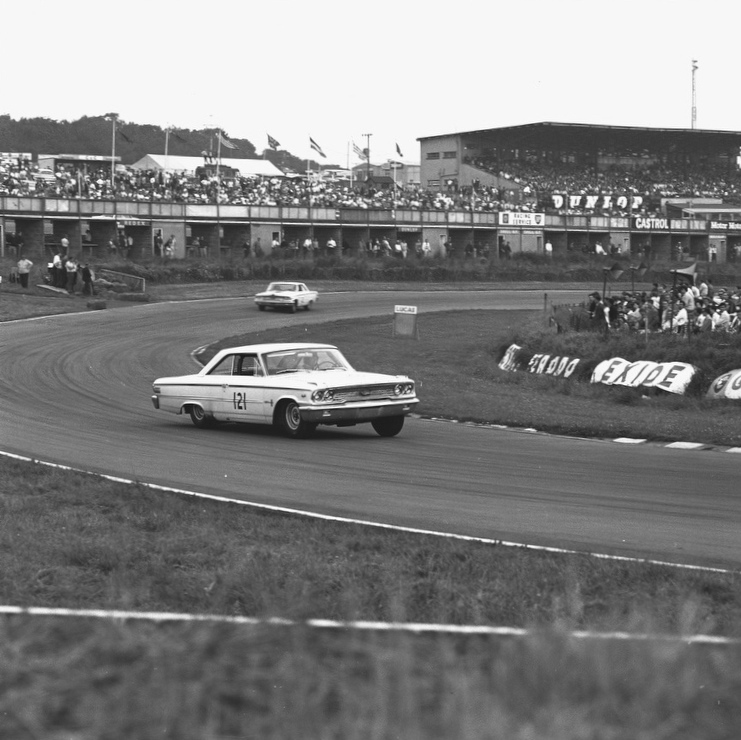 Instead, he could relax down at the lower end of the paddock with Alan Brown and the mechanics, settle himself into the Galaxie’s spacious, padded “bucket” seat and apply some of the intel he’d been given by Dan. The left-hand-drive Galaxie had a “four-speed, on-the-floor (L-shaped) shifter”, a lap seat belt only, a deeply-dished plastic steering wheel and a lateral (ie, not longitudinally-braced) roll-bar. 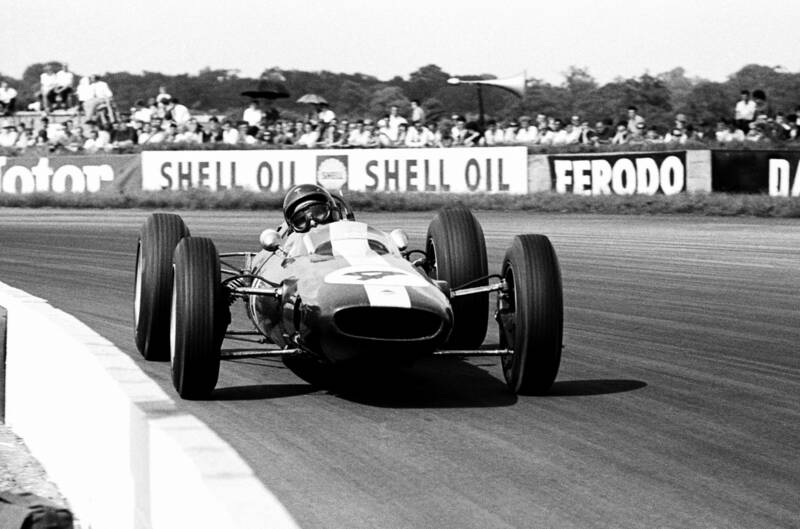 Driving it was all about taming the power – ie, minimising the wheelspin and the oversteer….and allowing for brake fade. 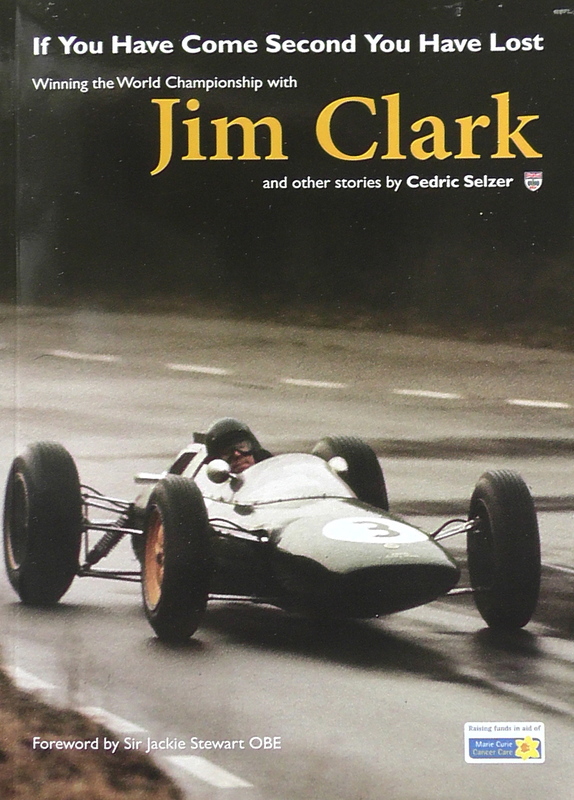 Why was Jim racing that Monday in a car he’d never even tested? As much as Jim loved to drive nimble sports cars on the road like the Lotus Elite, Lotus Elan and Porsche 356 he was also amused by the concept of big, comfortable American “slushmobiles” like the Galaxie. 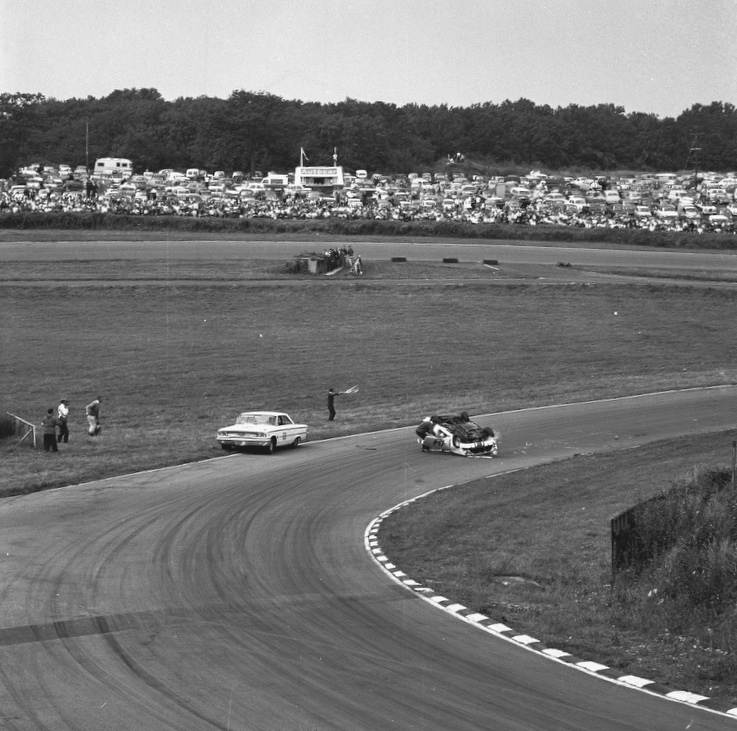 And controlling the Galaxie on a race track appealed to Jim’s sense of curiosity. Ask one of the current F1 drivers to compete in a Porsche Supercup race and their initial response – even before they considered the complication of contracts – would be to ensure that their image was not dented by the likes of a Sean Edwards; Jim had no such qualms. 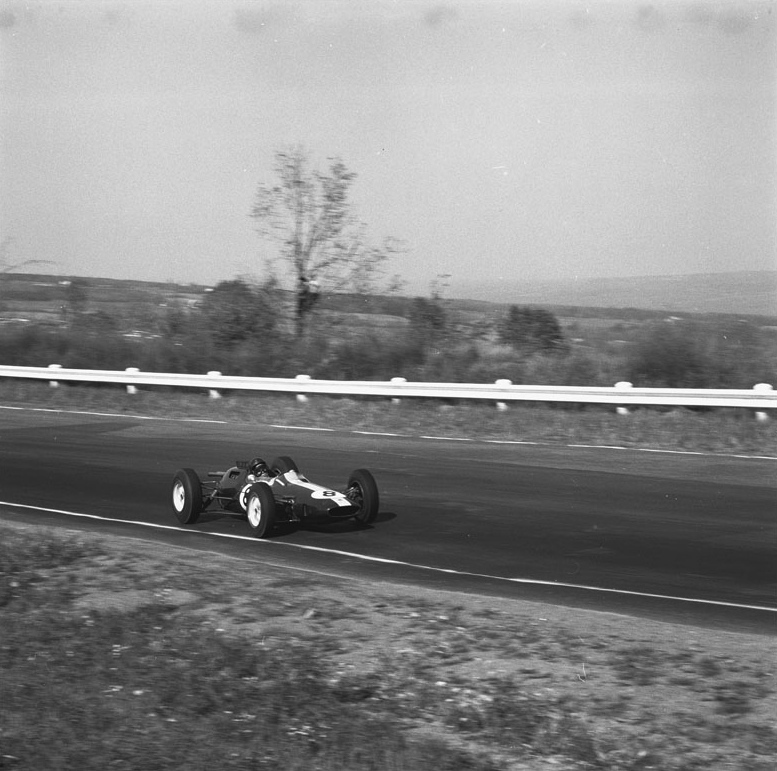 He was intrigued by the concept of racing the Galaxie; he liked the Ford connection, in view of his plans to race more extensively in the US; he liked the Holman and Moody people, who were at that point doing great things with the Falcon Sprint rally cars in Europe; and he wasn’t afraid of being beaten by an ace like Jack Sears: this was but a part of motor racing. 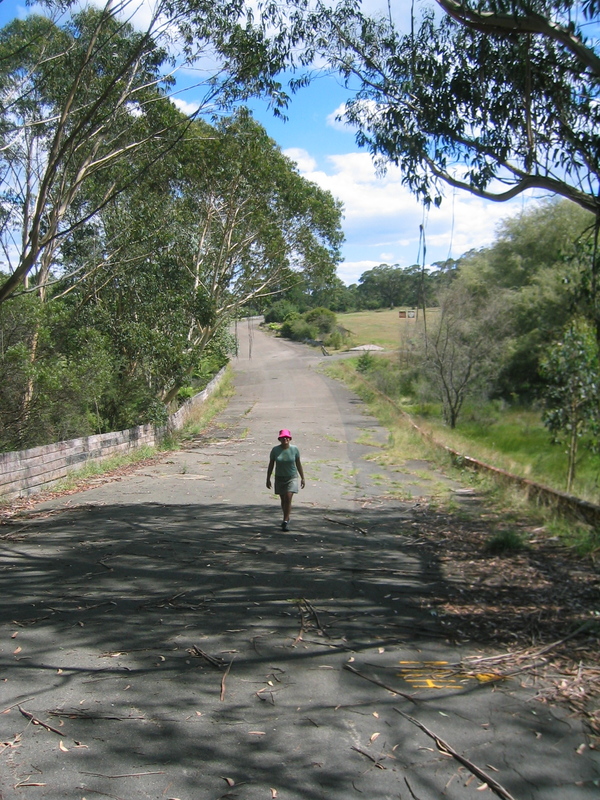 Jack, for once, ran into trouble – a punctured Firestone, to be precise. 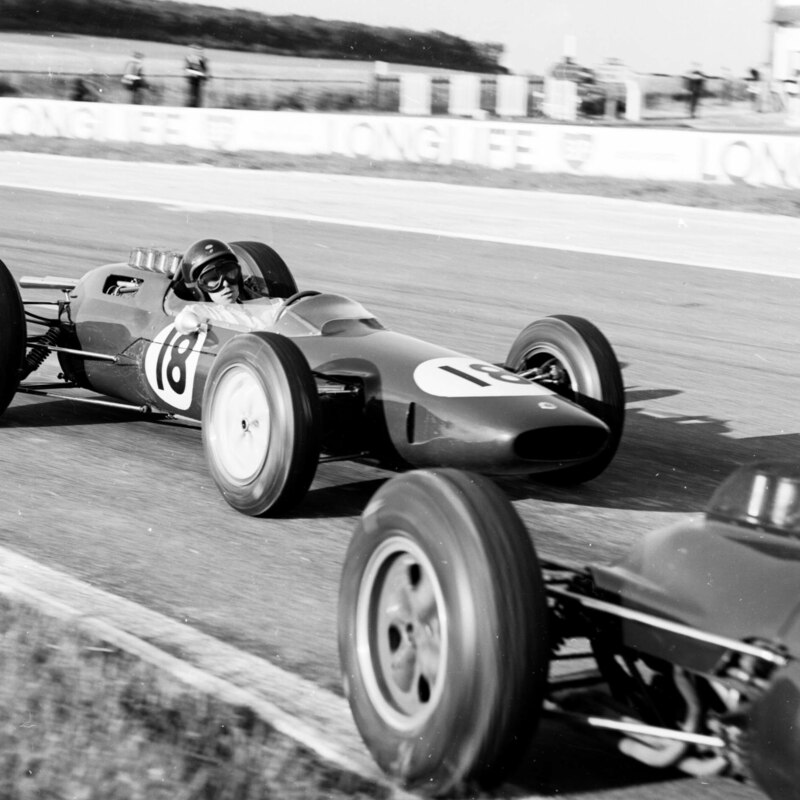 Jim was left to win from F1 arch-rival Hill – but not without incident. David Haynes demolished his Cortina GT on Bottom Straight right in front of Paddy Hopkirk’s Mini. Paddy took major avoiding action on the grass – but Jim, too, was forced to put two wheels out there on the turf to miss the melee. Fortunately, Haynes escaped uninjured. So Jim won the 20-lap Slip Molyslip Trophy for B-class Group 2 saloon cars. 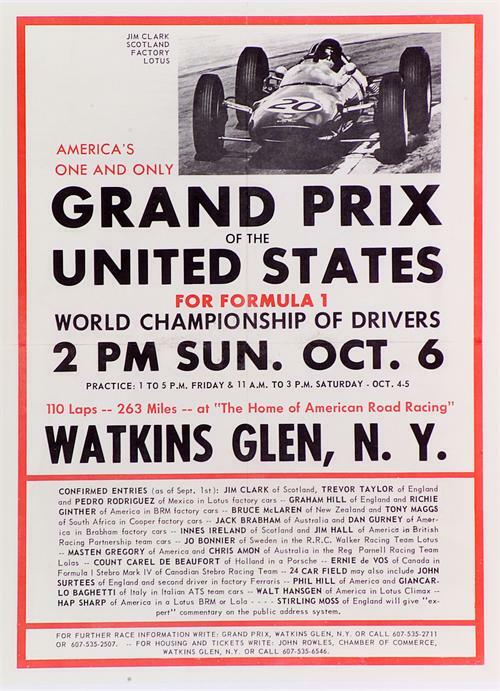 The race was considered at the time to be so minor that no pictures at all were published in Autosport of the F1 Championship leader in the Galaxie. 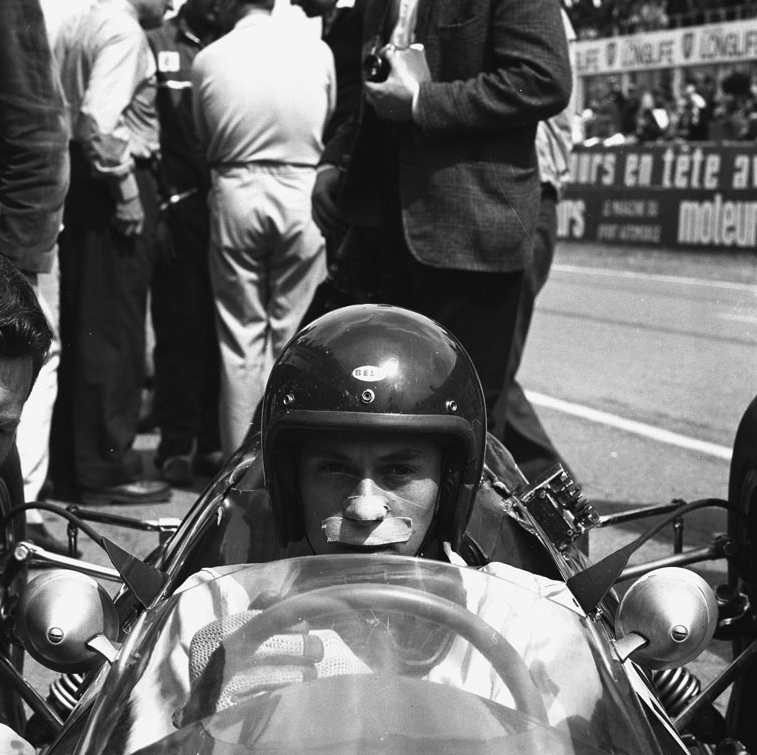 Instead, the headlines went to Roger Penske, who won the Guards Trophy with his Zerex Special (basically a Cooper-Climax F1 car with bodywork). 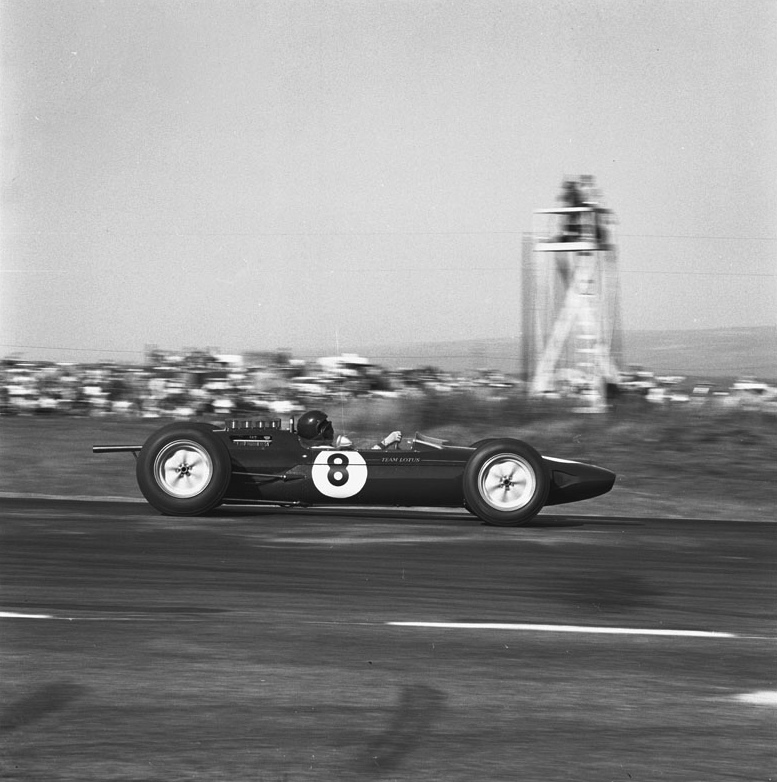 Frank Gardner’s Brabham beat the Lotus 23s in the sports car event; Bob Olthoff, who on August 18 would, with Jack Sears, win a 12-hour race in Washington, USA, in a Willment Cortina GT, took the up-to-3-litre class of Jim’s race; and Sir John Whitmore again reigned supreme in his Mini-Cooper. 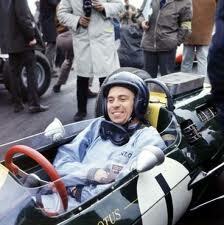 (Sir John would also win the GT race with his Stirling Moss special-bodied Elan.) Balfour Place was thus heaving that Monday night – particularly as Cleopatra was on the agenda for Jim and Sally. 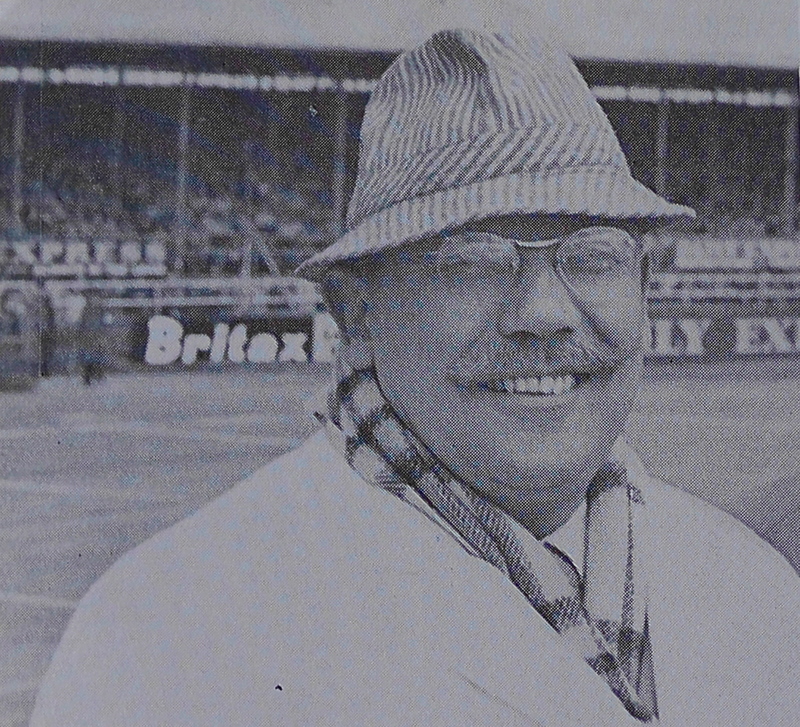 Jim would head over to Cheshunt on Tuesday to see Andrew Ferguson (to sort out some accounts!) 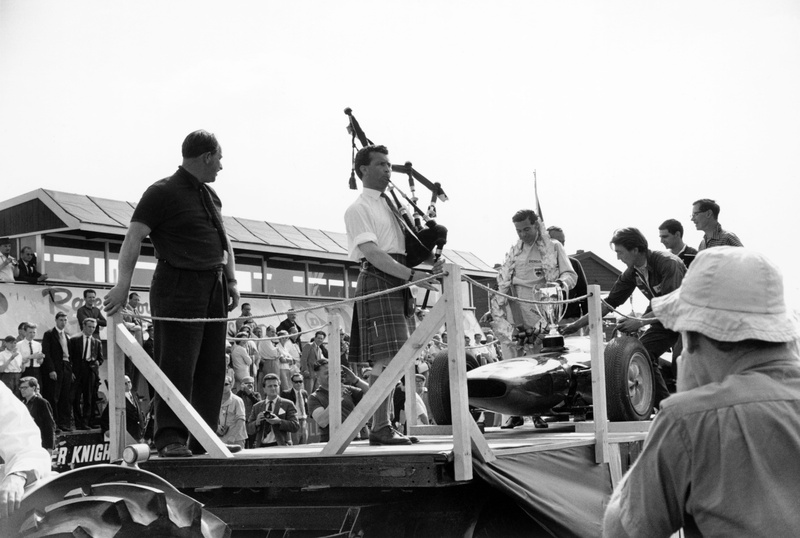 – and they would leave on Wednesday for Sweden, where Jim was due to race in the non-championship F1 event at Karlskoga, near Orebro, west of Stockholm. 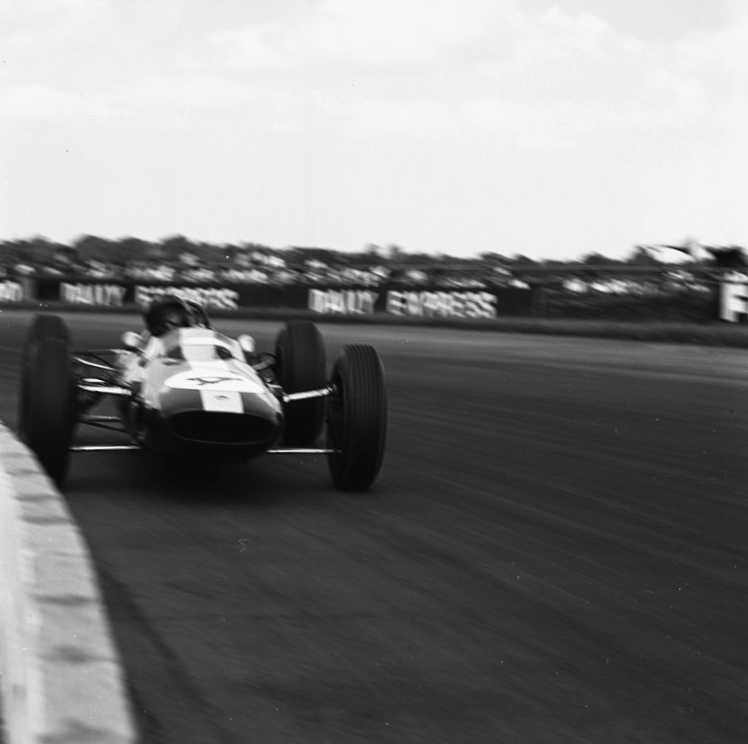 Jim had had the pole there in 1961 but had retired from the race with that old Lotus foible – broken front suspension. Here was a chance to redress the balance. 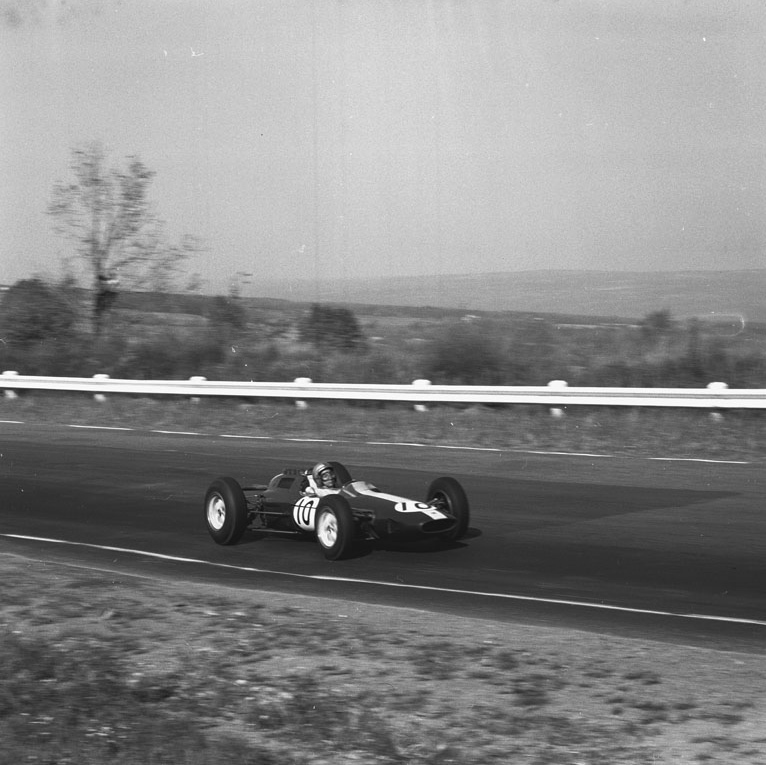 Also eagerly awaiting the appearance of F1 stars on his home track was an Orebro 19-year-old who had over the past 18 months been winning a string of kart races. His name was Ronnie Peterson.